Take 2 chewable tablets 1 to 2 times daily as needed, preferably with juice or water on an empty stomach. 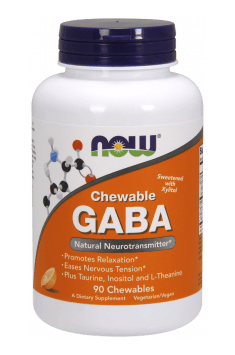 In special situations, you can enlarge daily dosage even to 8 tabs (2 g of GABA). Do not take this product for a long time due to potential addictive effect and body adaptation. Tablets containing magnesium, vitamin B1 and B6. They support the nervous system and muscles, reduce fatigue. Multivitamin without Iron delivers a full day's supply of 15 essential vitamins and minerals. A healthy blend of vitamins and nutrients. Supports child's healthy development.